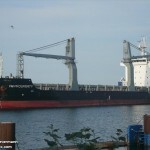 The 122 meter long, 9032 dwt freighter FM Prosperity went aground at Pichilingue near Acapulco, Mexico. 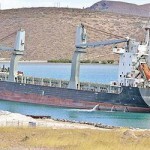 The vessel was leaving the port at Pichilingue with 4300 tons of rebar with a pilot on board. The pilot had made a navigation mistake causing the vessel to go aground a meters from the shore. No reports of injuries or pollution released. Initial attempts to refloat the FM Prosperity failed. A larger tug was requested and pulled the freighter free on the high tide.